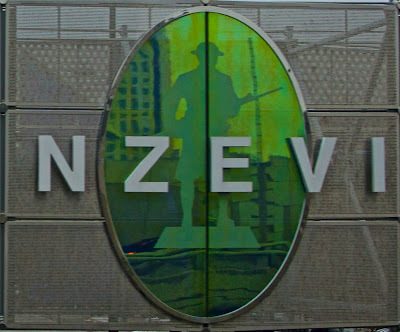 While you are on the Stevenson Expressway, near Martin Luther King Jr. Memorial Drive, there is a large sign identifying the area as Bronzeville, a subsection of the Douglas Neighborhood. The area has a lot of history and, based on a little research, quite a bit of public art and historical plaques (thus, moving it up on on my list of future photo excursions). I've never quite been able to get a photo of the whole sign because stopping your car on the expressway is very dangerous and generally frowned upon. This is the center portion of the sign. I'm pretty sure the image depicted in this logo is the Stephen Douglas statue, which is in the area. I have a correction: The image is the Doughboy statue from a memorial, in the Bronzeville area, to 187 national guard members who died in WWI. Thanks Jim (who's informative Chicago photo blog is here)! So glad you didn't stop on the expressway, not a good idea at all. Sounds like an interesting area. Great shot of the DeStefano signage! The statue, I'm pretty sure, is a replica of the "Doughboy" statue at the intersection of King Drive and 35th Street, a memorial to the 137 members of the 8th Infantry Illinois National Guard (redesignated 370th U.S. Infantry Regiment) who lost their lives during World War I. Thanks, Jim! Your information is VERY appreciated. I usually have good luck finding out more information about what I've posted but I hit a road block with the image on the sign. One correction: The designer of the sign is A. Epstein and Sons Architects and Engineers. 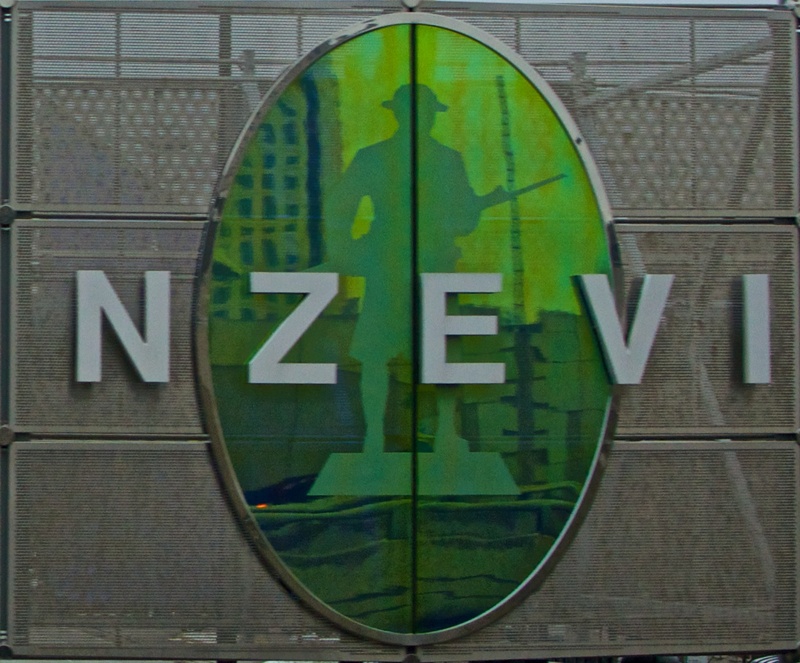 The image on the Bronzville plaque is indeed the "Doughboy" sculpture, and the structure it is part of is called the "Portal". It was designed and constructed as part of the McCormick Place West Expansion, completed in 2007, also with Epstein as lead architect of record. The Portal is a "double-gateway", identifying Bronzeville when traveling or looking southward and becomes a McCormick Place Gateway when traveling or looking northward. A McCormick Place icon replaces the Doughboy on the other side of the structure. The Portal is constructed as a lightweight tensile structure to span 150 feet across both north and southbound lanes of MLK Dr.